German authorities plan to terminate a North Korean business in the heart of Berlin - a big hostel next to the communist state's embassy. The move is in line with UN sanctions aimed at curbing Pyongyang's nuclear weapons capability. German media say City Hostel Berlin is run by a Turkish hotelier who pays more than €38,000 (£32,000; $41,000) a month in rent to North Korea. The embassy also derives income from a conference hall at the site. North Korea has conducted several nuclear tests and launched missiles, provoking fears that it could one day hit Japan or the US with a long-range nuclear strike. German Foreign Ministry spokesman Martin Schäfer said "any kind of commercial activity on the site of the embassy or in relation to the embassy is prohibited". 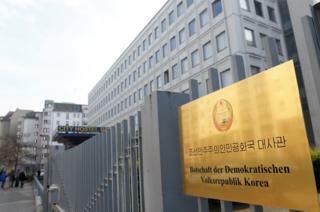 "City Hostel in Berlin constitutes neither a diplomatic nor consular activity of a North Korean foreign representation," he said, adding that the government will move to "shut down the financial source to the North Korean regime as quickly as possible". Germany's Berliner Zeitung newspaper says (in German) the ministry has warned the leaseholders that they must end their contracts with North Korea - otherwise they face hefty fines. City Hostel Berlin was built in former communist East Germany and at the time housed North Korean embassy staff. It is a popular budget option for travellers to Berlin, who can stay in an eight-bed dormitory room for just €9.50 per night. The business relationship with North Korea was not confirmed by hostel staff, German media said. UN Resolution 2321, adopted unanimously in November, tightened sanctions on North Korea, in response to Pyongyang's 9 September nuclear test. It includes a clause stating that "all Member States shall prohibit the DPRK [North Korea] from using real property that it owns or leases in their territory for any purpose other than diplomatic or consular activities". Markus Ederer, state secretary at the German Foreign Ministry, said "we must step up the pressure in order to bring North Korea back to the negotiating table". The UN sanctions must be implemented to the letter, he said, "so it is especially important that we act to cut off the activities funding the nuclear programme".